Joel Feder February 12, 2019 Comment Now! 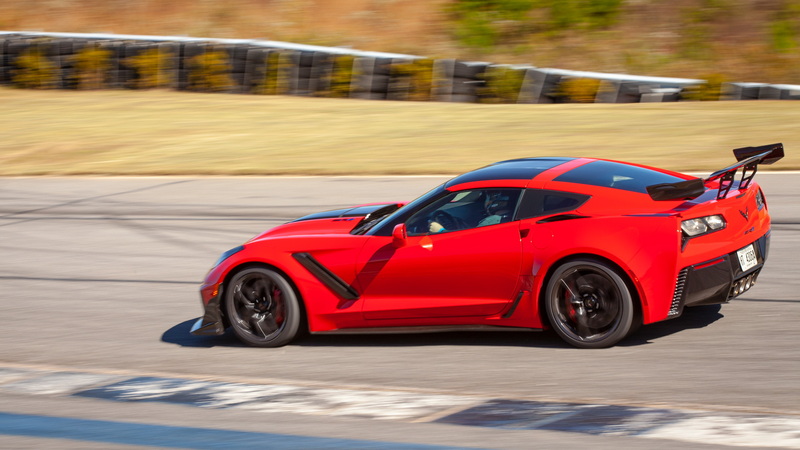 The 2019 Chevrolet Corvette ZR1 is a weapon. It was named Motor Authority Best Car To Buy 2019 after it vaporized the competition. It's an all-American supercar with 755 horsepower and 715 pound-feet of torque from its supercharged 6.2-liter V-8 engine. Buyers can choose to #GiveAShift with a 7-speed manual, or put down the quickest time at the track with an 8-speed automatic. For the first time in ZR1 history there's a convertible model, but every ZR1 is actually a targa just like other C7 Corvettes. 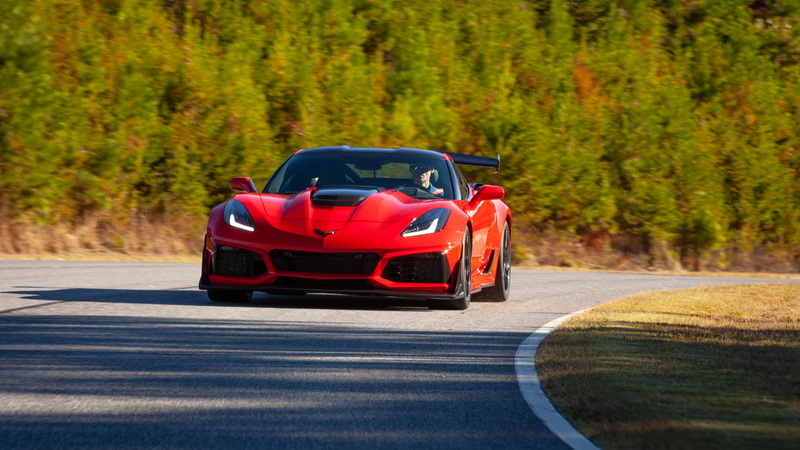 With performance specs like a 0-to-60-mph sprint of just 2.85 seconds, a dash down the quarter-mile in 10.6 seconds, and a run from 0-100 mph in 6.0 seconds on its way to a top speed of 212 mph, the 2019 Corvette ZR1 isn't slow. Spoiler: It's fast as hell. It even destroyed the Ford GT's lap record at Virginia International Raceway's Grand Course West with a time of 2:37.25 during routine testing in 2018. That's not a joke. Those who find themselves inside the Corvette ZR1—driver or passenger seat—will find themselves staring at the top of the supercharger. The supercharger, which has 52 percent more displacement than the LT4 supercharger found in the Z06, is so tall that its carbon-fiber cover sits above the hood line. It's always in the field of vision. Yes, an actual hole. The hole in the hood is necessary because the massive supercharger is so tall it won't clear the hood line. Rather than raise the entire hood line the design team just, well, created a hole in the hood. Pop the hood and impress your friends, or act like someone cut a hole in your hood and you're distraught about it. There's loud, and then there's ZR1 loud. Yes, there's a difference. During development on the Nürburgring, spy video showed it had to be equipped with extra piping to quiet it down as it broke the 100 db noise limit. Flat out in second gear on the racetrack, it rattled our brains, even in a helmet. Earplugs are a good idea while hauling around a racetrack at full speed. Those wide, sticky Michelin Pilot Sport Cup 2 tires that are included in the ZTK Track Performance Package come with a price: They want to follow every crack, crevice, and seam on the road. The staggered setup with narrower 285 mm tires up front help the situation and it's nowhere near as bad as the Ford Mustang Performance Package Level 2 and its square 305 mm Cup 2 setup. Still, the ZR1's tires can be tiring for some. The interior of the Corvette ZR1 is that of a really nice C7 Corvette, but the steering wheel and seats are terrific. The flat-bottom steering wheel features real carbon fiber, and suede at 9 and 3 where the driver's hands should be. The sport bucket seats in some trims feature carbon fiber back panels. Carbon fiber can be overplayed and tacky, but in the ZR1 it's a perfect fit. Every 2019 Corvette ZR1 has a rear wing. A shorter wing is standard and produces less drag for higher top-speeds, but those who are willing to trade absolute top speed and add drag in the name of immense downforce can opt for the ZTK Track Performance Package for $2,995. With the Cup 2 tires and performance suspension comes a massive, stanchion-mounted adjustable carbon fiber wing that is perfect for eating lunch on, taking a nap on, or applying a whole lot of downforce at speed. It's also quite noticeable. Want to actually open the hatch? Be careful as there's no clearance for fingers between the wing and rear portion of the decklid. Load luggage from the side of the car, please. Some of the earliest spy shots of the 2019 Chevrolet Corvette ZR1 showed us this design nugget, and the production car delivered: The wheels are very Ferrari-esque. Some might see some F40 in the wheels, or even F50, but there's no denying the C7 ZR1's wheels look like something that could have come from Maranello. 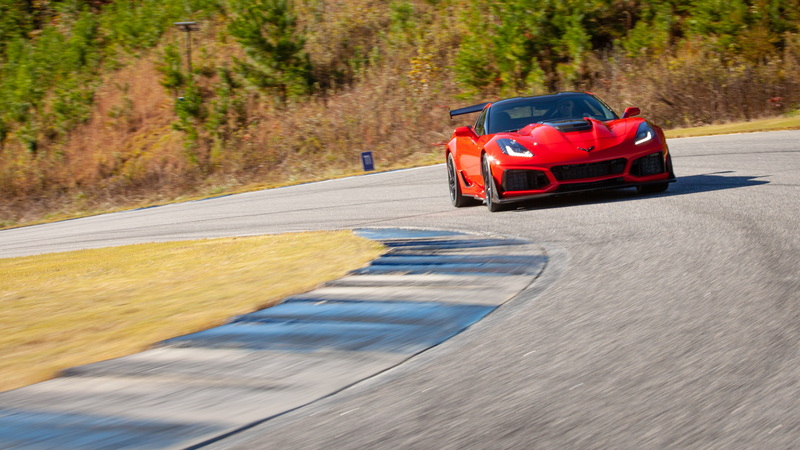 Whether cruising in seventh gear down the freeway, blasting down a front straight at Atlanta Motor Speedway at 125 mph, or weaving through a chicane at 80 mph, the ZR1 is far more stable than expected. Its grip and steering inspire confidence, and the driver's talent is likely to fall short long before this all-American supercar reaches its limits. 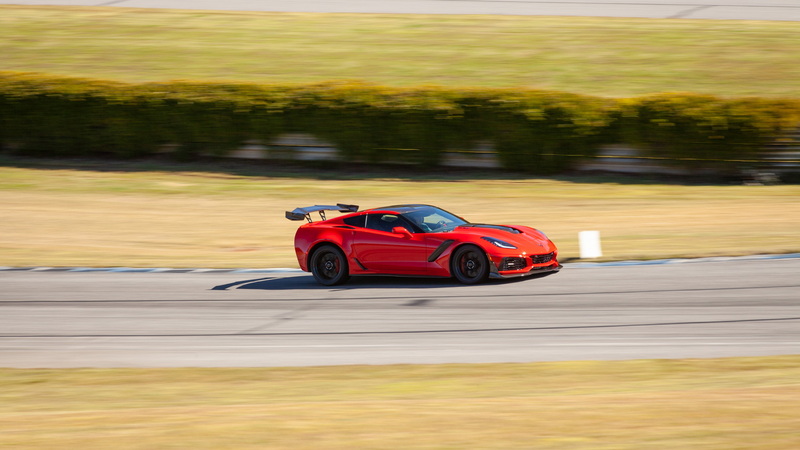 It's hard to convey in words just how fast the C7 Corvette ZR1 is. The performance numbers speak for themselves, but it's that feeling at 105 mph when the supercharged 6.2-liter V-8 is firing at full tilt and long hood is surging forward at a rate that is nearly unbelievable. The power seems to build forever and come from a never-ending well. 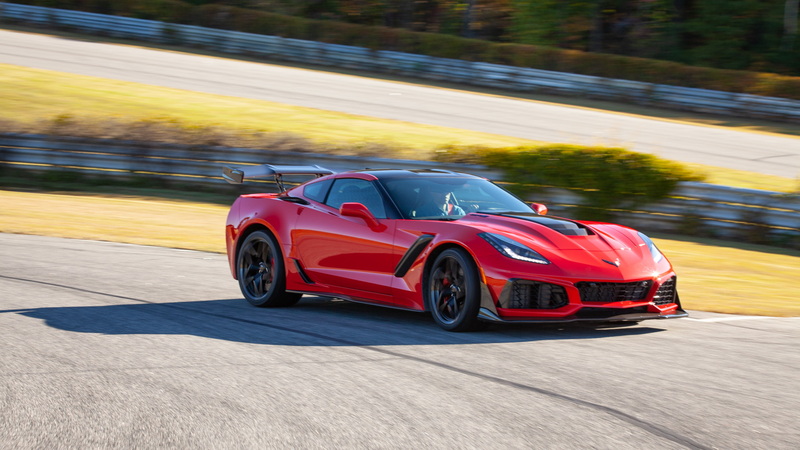 Hard to imagine a claim that the 2019 Chevrolet Corvette ZR1 is a bargain with an as tested price of over $130,000, and a base price of $122,095, but it is a bargain. It destroys cars that cost more than $400,000. In reality, it can pretty much keep up with or best anything that costs $1 million or more. For a car built in Bowling Green, Kentucky, with a Chevy badge that's quite a feat, and makes it a stellar value.